You may be wondering why I'm reading this book? Well, it's one I bought as part of a directors course I completed back in the mid 1990s and never read. Now that I'm seriously back into animation and doing some of my own voice acting I figured this book would probably have some good pointers. At 373 pages it's packed with information about every aspect of acting from how to break into the business through to TV studio floor manager hand signals, director speak and more. A chapter that particularly stood out to me was the one dealing with vocal exercises. I'm challenged when it comes to getting expression and range into my voice, so that's a chapter I may return to, as it runs through a whole bunch of specific exercises to practice to get your jaw working. If you're not familiar with Brian Adams, you're in good company, neither am I. Not even when I bought this book did I have a clue as to who he was. However it's very likely I've seen his work through the 1970s and 80s (I know I have because I've seen some of the films in his Filmography on his IMDB page). I'm guessing much of his work has also been in theater since he gives almost as much advice in the book about working on stage compared to screen that he could have titled the book 'Stage and Screen Acting'. What's really great about the book is that it is filled with words of wisdom from some of screen acting's greats from the Golden Age of Hollywood. Many of whom Brian spoke with personally. People like Humphrey Bogart and Sir Laurence Olivier as well as more contemporary actors such as Harrison Ford. 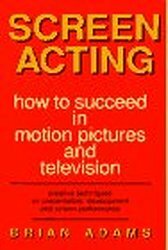 If you do have an interest in becoming a screen actor then this is a worthwhile book for your collection and probably a good first book if you're looking around for something to get you started. Although many more opportunities for actors have opened up with the introduction of the internet and production companies creating online content this book will still give you a good grounding in mastering your craft ready for that next opportunity. It's more than what you'll ever need if you're like me, just looking for tips to improve your voice acting but it still makes for an interesting read and is a genuine glimpse into the world of an actor.